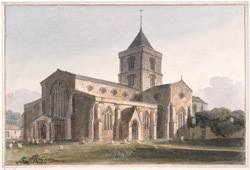 View of St Nicholas's church in Arundel. Kelly's Post Office Directory of Essex, Herts, Middlesex, Kent, Surrey and Sussex, 1867 says: "The church of St. Nicholas, with the college and its chapel, which occupies the usual site of a chancel, was built in 1380, and has a fine stone pulpit. The Fitzalan chapel contains the tombs of the illustrious princes of the houses of Fitzalan and Howard, particularly the tombs of Eleanor, Countess of Arundel, 1418; John, Earl of Arundel, 1431; William, Earl of Arundel, 1488; Thomas, Earl of Arundel, and his Countess, 1534; Henry, Earl of Arundel, 1579; Thomas, Earl of Arundel, 1415: many of the Dukes and Duchesses of Norfolk, and Earls of Arundel, are buried in two vaults under the Lady chapel."